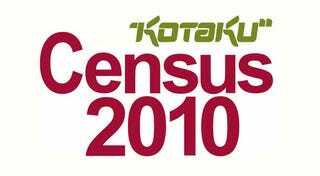 As you know, the results of our little Kotaku Census are in. And while infographics are pretty, I also promised I'd give you the results in full. So here they are! On the whole, they're great reading. While some questions presented predictable results, and some didn't really tell us much (the "genres" question was multi-choice, but the results indicate many people didn't select multiple genres), most provide a nice insight into your likes and dislikes, and some even go so far as to surprise the crap out of us. There were also a few polls that suffered from the odd oversight or two. No Chinatown Wars in the GTA post, for example. For that, I am sorry. I am but one man, not an entire census bureau. Below you'll find the results of every poll we ran last week (to see the charts in more detail, click on them). In the interests of transparency, I've published not just the raw results, but also the number of participants in each set, lifted straight from our polling software. As you'll see, the average number of responses we had for each question was usually between 20-30,000, an incredible number, and one which gives these results one hell of a sample group. Please note that this census was in no way prompted, promoted or requested by any marketing agency, advertising team or video game publisher. We came up with these questions ourselves, in an effort to not just get to know your feelings on a range of subjects, but to inform you on the opinions of your peers/friends as well. We know it's not hard science. And we're not trying to pass these results off as some representation of the average video gamer, either. What they are is a study in the habits of you, the reader of Kotaku. That's it. So enjoy! - 65% of you own multiple consoles, while a quarter of participating Kotaku readers are in possession of all three current generation machines. - Only 5% of participating readers own a PSPgo console. Sorry, Sony. - 66% of participating readers have reported that at least one Xbox 360 console has failed on them, while 32% report multiple failures. Today&apos;s census questions are all about pirates. Yaaarrrrrrrr! - 79% of participating readers have pirated a PC game. 79%! - 42% of you don't play any kind of MMO whatsoever. - 78% of participating readers have bought games digitally. - Only 19% of you can play Crysis as nature intended. - Only 6% of participating readers are PC snobs, 94% of you playing games on at least one other system. - A lot more of you would take Valve over Blizzard. - You prefer Mass Effect to Halo. - Asking for "favourite franchise" on PC was a stupid idea. - Smash Bros. is more popular a fighting game than Street Fighter amongst participating Kotaku readers. - Modern Warfare 2 may have the sales records, but its predecessor is your favourite Call of Duty game. - You play an astonishing variety of games. - Nearly 60% of participating readers don't play any kind of sports game. That's surprising. - 46% of you spend most of your time alone, with singleplayer games. - Nearly half of participating readers have packed their music game instruments away, no longer playing games like Rock Band or Guitar Hero. What&apos;s this MIT grad doing working at a tire factory in Compton?